Beautiful Small Tribal Antique Caucasian Avar Rug , Country of Origin / Rug Type: Caucasian Rug, Circa Date: 1910 – This unique, antique rug boasts a simple yet detailed tribal rug design. 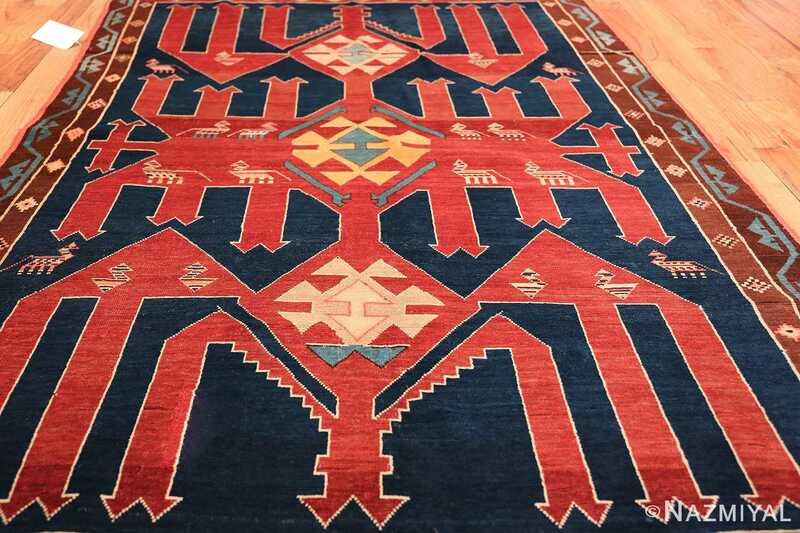 The bold primal colors of this fascinating antique Avar rug compliment the bold geometric rug design in the most perfect way. The combination of the royal blue background and brick color of the main design creates a beautiful juxtaposition that is artistic yet not overbearing. 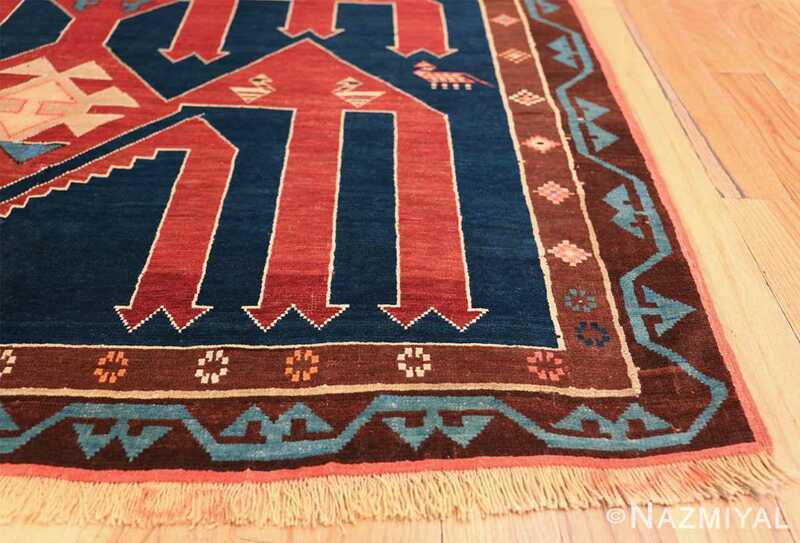 While this antique Caucasian rug was created for using on the floor, it is so tastefully put together that it could be used on the wall as a Tapestry. 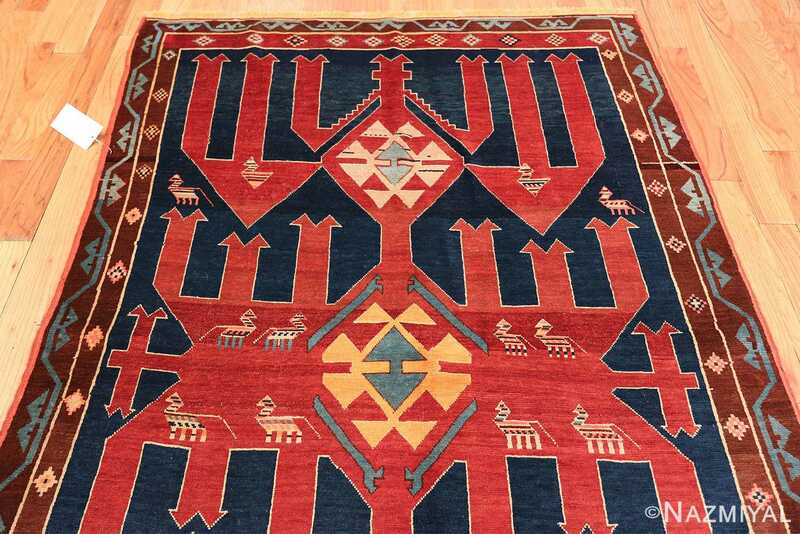 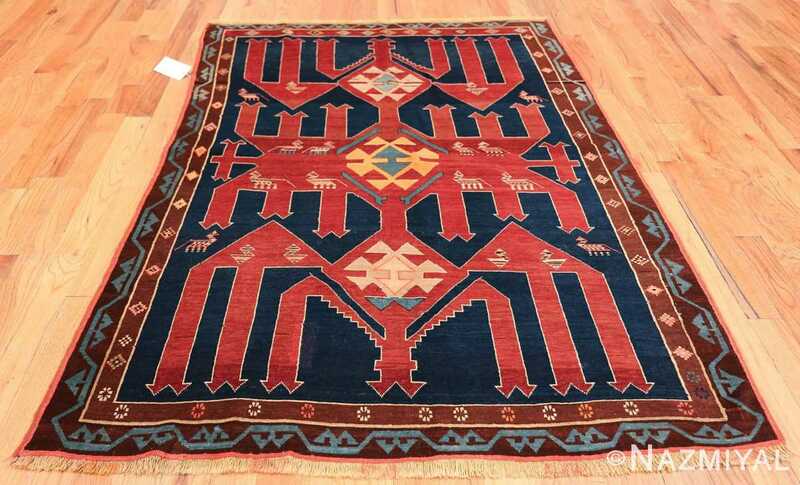 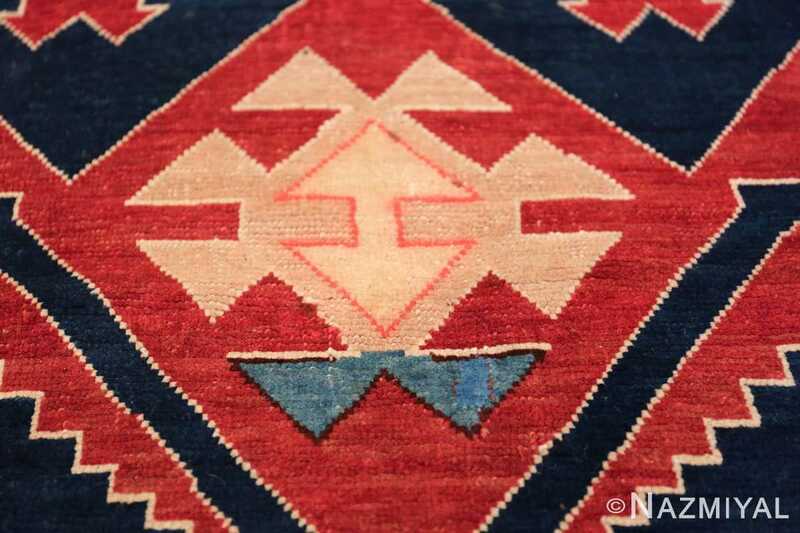 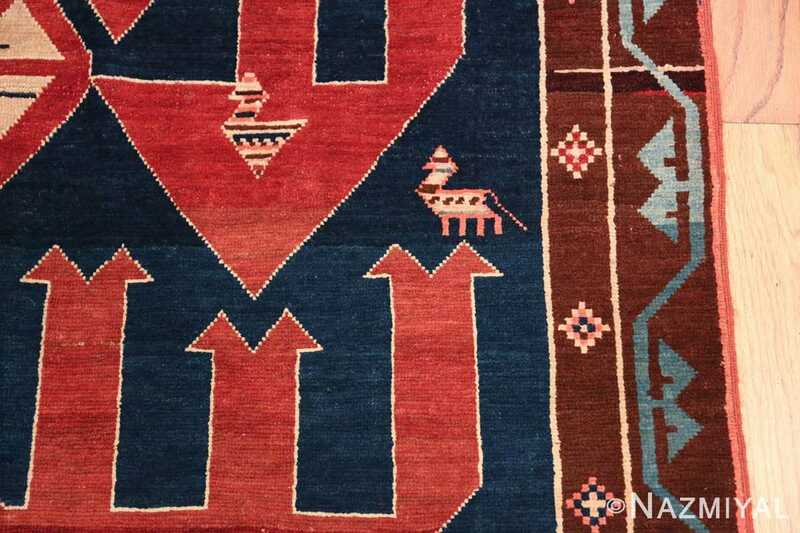 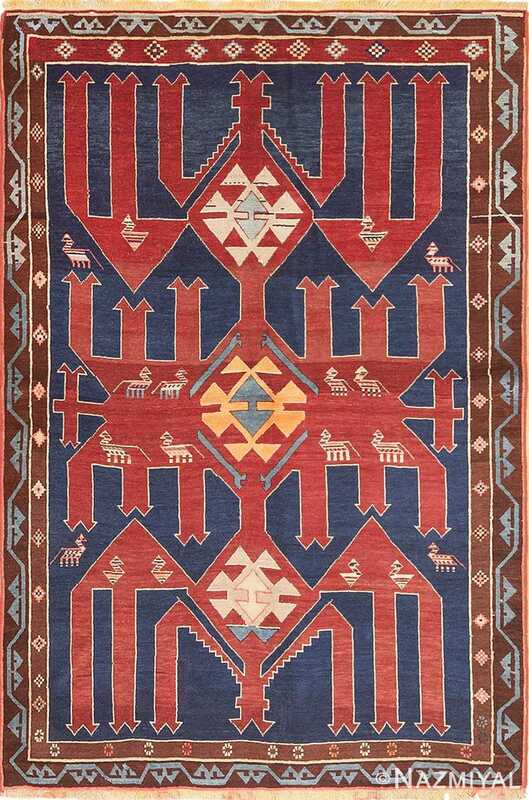 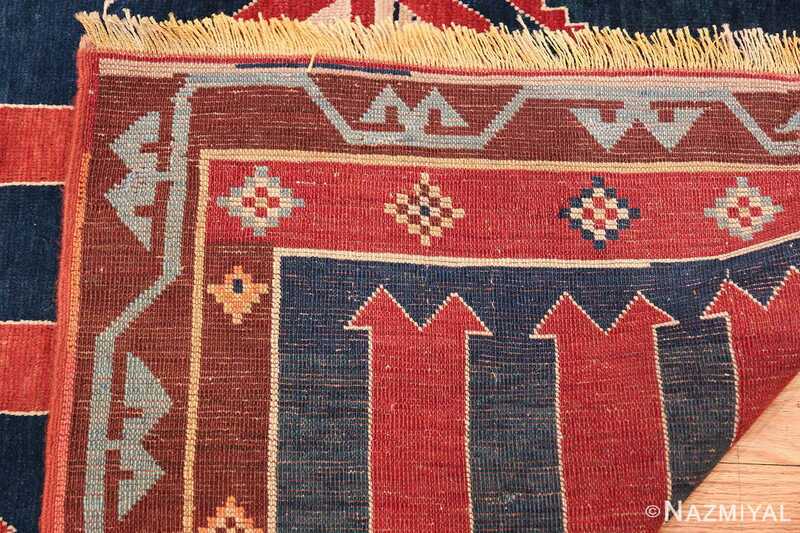 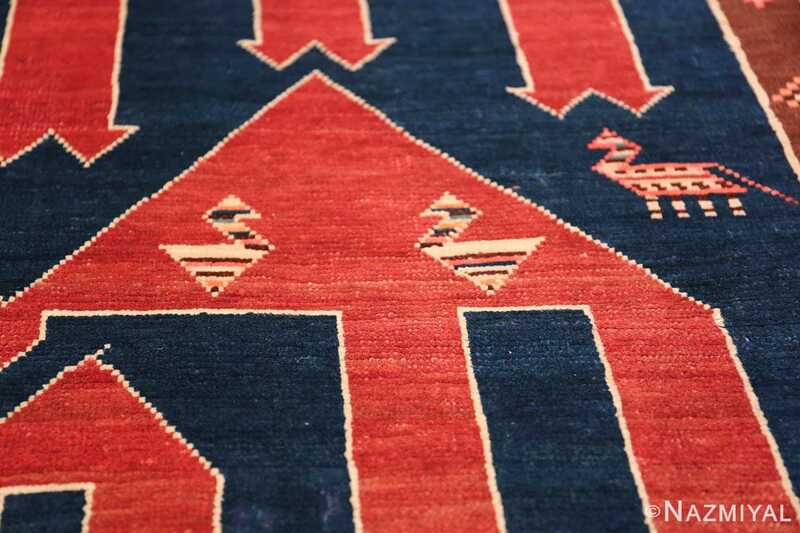 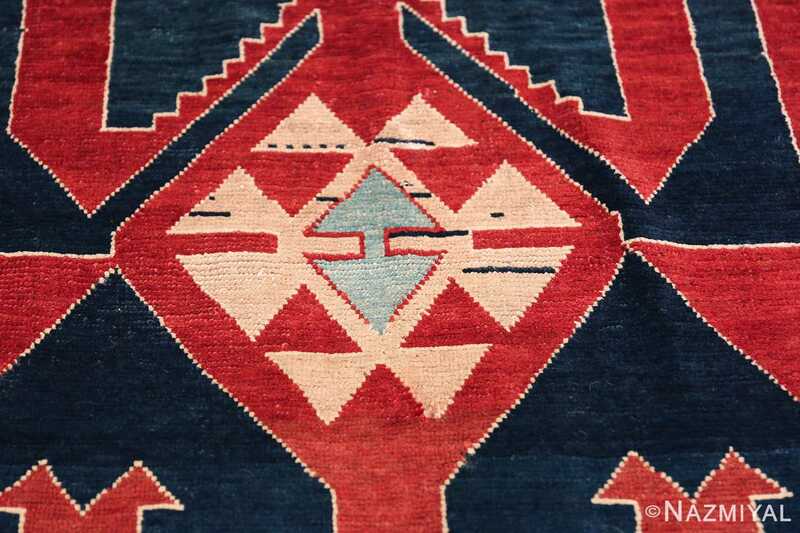 The rich colors and bold tribal patterns of this small tribal antique Caucasian Avar rug are sure to spark the imagination and pique the interest of those who see it. 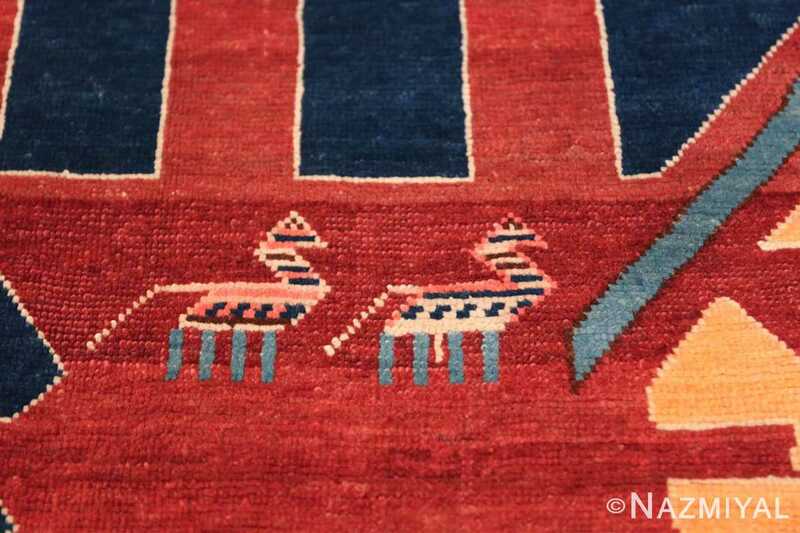 The most dominate colors that are found in this small size rug are a bold, brick red and the rich royal blue color of the background. In addition to this dominant colors, we see a multitude of fascinating secondary colors. 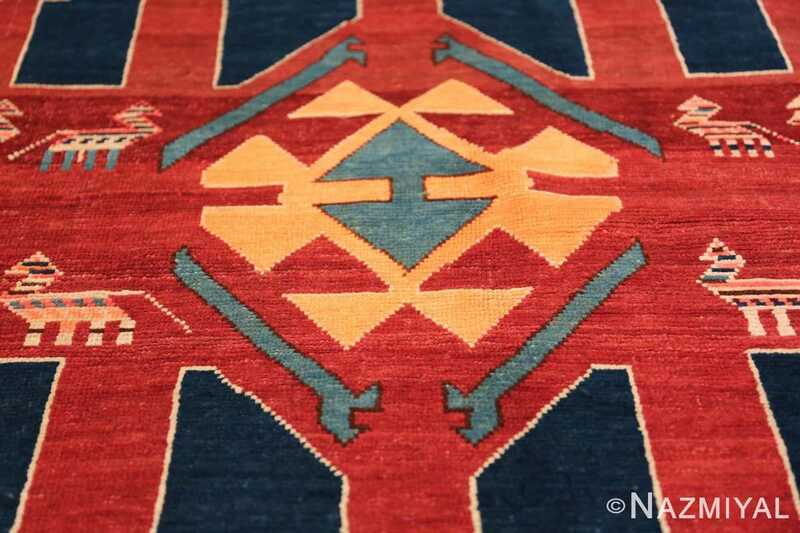 Different shades of brown, cream, saffron and light sky blue are also found on this antique carpet and combine to create a wonderfully artistic rug. 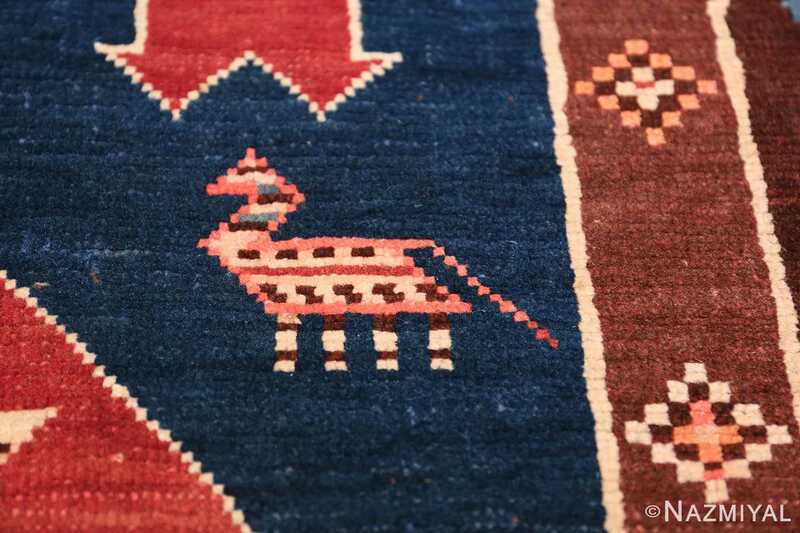 In addition to the more bold amorphic patterns, we find some geometrically rendered animals. These consist of both birds as well as beast of burden that add a scene of delight to the overall composition of this small tribal antique Caucasian Avar rug. While this antique carpet was woven about 100 years ago, it’s geometric design and bold coloration make it quite versatile. 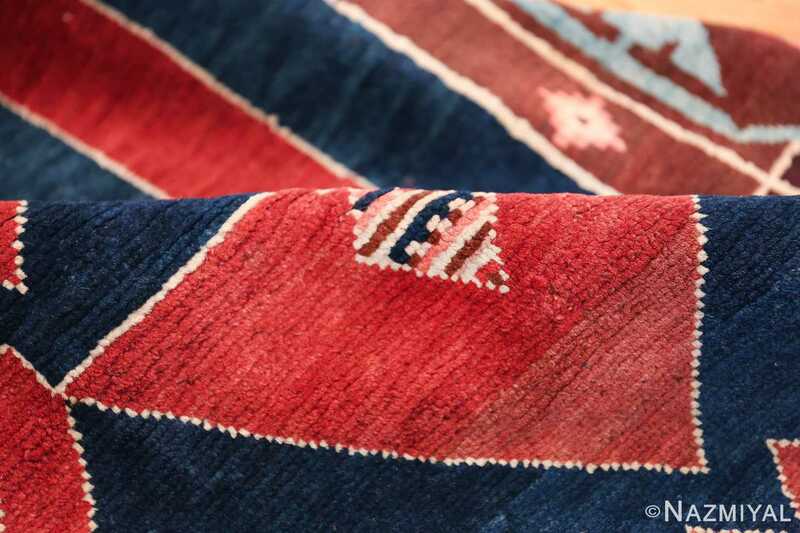 It could be incorporated in mid century modern home decor just as effortlessly as it could be used in more traditional or even minimalist interiors. This magnificent example is the type of piece that is sure to become an instant heirloom piece for future generation to marvel at and enjoy. 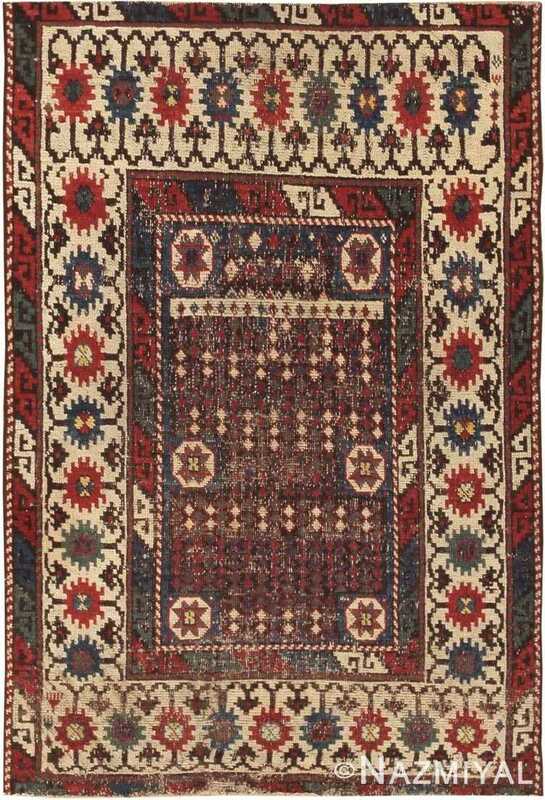 This antique Turkish carpet features a variety of tribal patterns woven in a classic combination of ivory, red and blue with secondary accents in green and a somber charcoal-brown.